Having enough stowage space while maintaining a luxurious aesthetic was a major concern for everyone involved in the build of Jarrett Bay’s latest beauty Waste Knot. 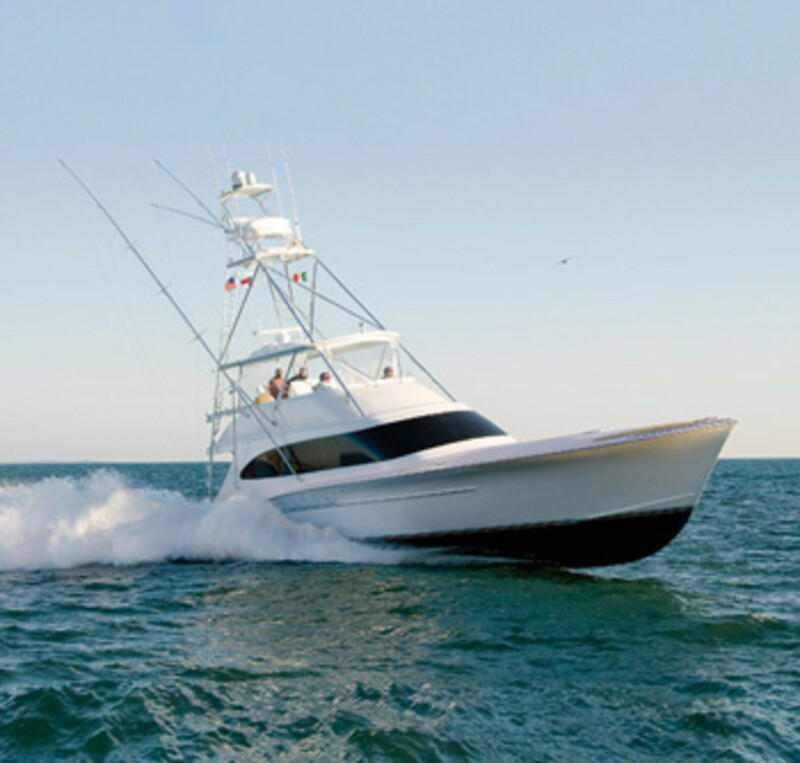 “The owners didn’t want to restock for months at a time, so we accommodated that,” explained project manager Gary Davis as we worked our way through the boat at her home port near Beaufort, North Carolina, opening every scuttle and access panel. 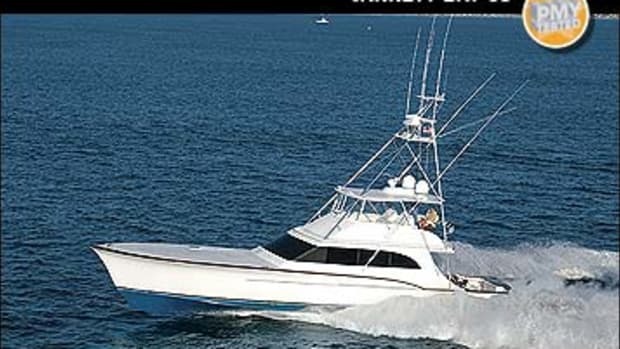 The 67 was on her way to Mexico the next day so she was fully laden: There were meats in the freezers underneath the mezzanine and beneath the L-shape settee on the flying bridge, and cut-out foam padding under every berth held reels, sinkers, and tackle. A cedar-lined closet at the base of the interior stairs was stocked with rods, while leather-and-ostrich-clad saloon couches hid crates of bottled water, canned food, and more. 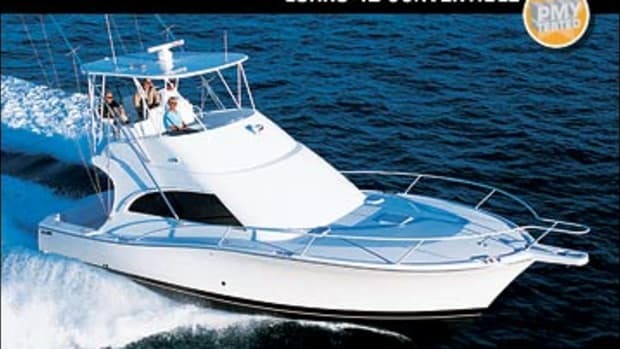 This boat had been built around the idea that the owners should be prepared regardless of the circumstance, and it showed. The electronics had been selected for the same reason. The helm contains a 15-inch Furuno display running the NavNet 3D software (there’s also an eight-inch display in the tower). Should this ever fail, there’s a stand-alone Northstar 6100i chartplotter to port. 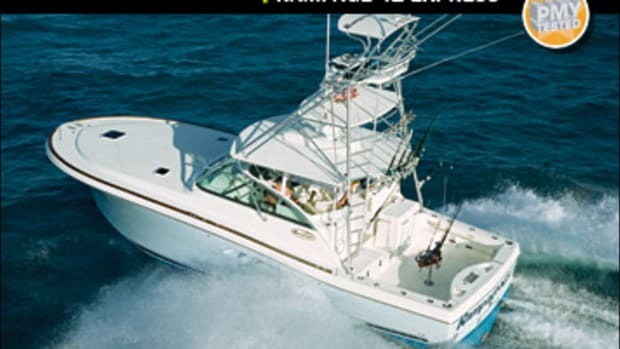 Other key features include a DD1 digital depthfinder, BBWx1 Sirius weather radio, FCU-1150 fishscope, and Simrad AP-28 autopilot. Although all will display things otherwise invisible (the bottom, fish, distant weather, and the rhumb line), perhaps most useful is the FLIR infrared camera, which allows you to spot something else important: the bow. You see, the captain’s custom helm seat is a mere 3&apos;9" from the back of the air-conditioned flying bridge. 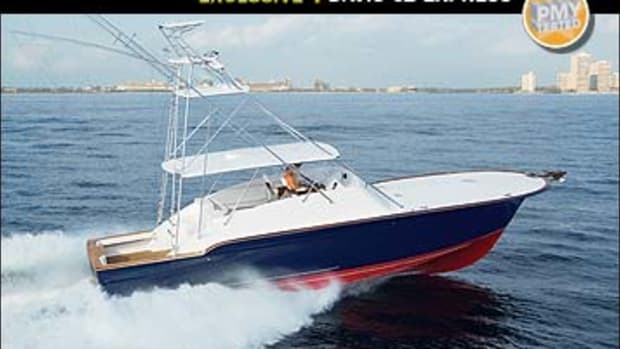 Although this provides great visability when backing down, the location precludes all but the tallest helmsmen from gazing through the EZ2CY enclosure to the teak-inlayed foredeck (see “Noteworthy,” this article). Flicking on the FLIR produces a clear picture of what’s on the foredeck, not to mention what’s ahead of the boat, even in inclement conditions. 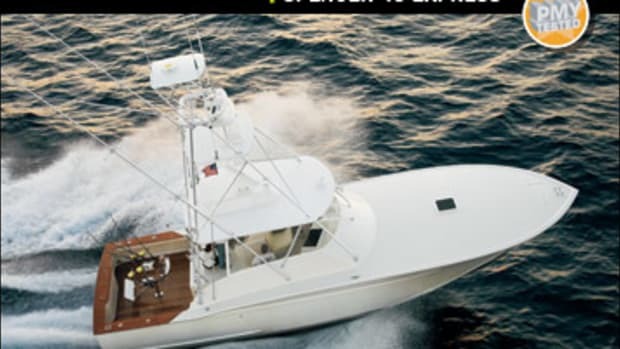 Cameras on the 48-foot hydraulically deployed Rupp outriggers provide a picture of what’s happening in the water behind Waste Knot just as effectively, thanks in part to a six-zone Elan entertainment system in the interior. It comes with an LCD touchscreen, three XM satellite radio tuners, and one 42-, two 22-, and two 19-inch Toshiba LCD TVs hooked up to a TracVision receiver. Plus there’s a four-terabyte hard-drive for movie stowage. The outrigger cameras are linked to the system (as are the Furuno displays), and since each of the six stations is independently controlled, one person can watch a movie while another eyeballs the baits. 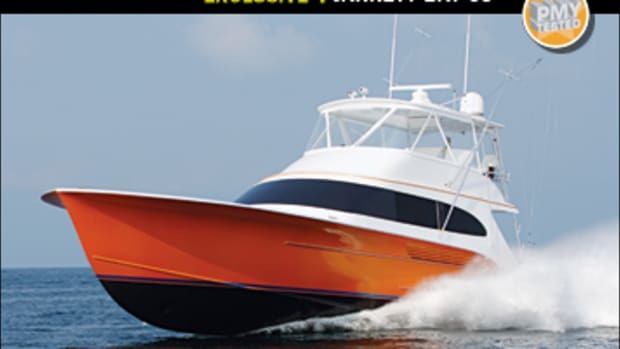 However, those aboard may occasionally have to turn up the system’s volume, since the twin 1,825-mhp Caterpillar C32 ACERTs produce a considerable growl. At 1000 rpm I recorded 79 dB-A at the helm (65 dB-A is the level or normal conversation), and at WOT I got readings of 77 dB-A in the VIP and 84 dB-A in the master—this in spite of three inches of 3M soundproofing surrounding the engine room, hand-laid fiberglass-encased fir stringers, and plywood soles covered with plush carpeting to soften the sound. (For the rest of the helm readings, see “By The Numbers,” this story). But although the big V-12s generate some sonance, they’re the way to go if you want to get to the canyons well before the pack, which is why the owners opted for them. (Waste Knot cruises at a time-saving 39 mph.) Being electronic, the C32s are just as happy at lower rpm levels. Thus they provide these owners the flexibility to choose the pace of a trip, just as all that tackle stowage gives them the ability to pick the perfect lure. I appreciated that the Cats’ service points are either on centerline or, like the Racors, mounted within quick reach on the aft bulkhead. The battery banks are outboard of the engines, each molded container holding six Northstar NSB-G-3100 AGM batteries. As for the twin 21.5-kW Cat gensets, they’re in a small pump room aft of the ER. The entire layout is clean and well-thought-out. 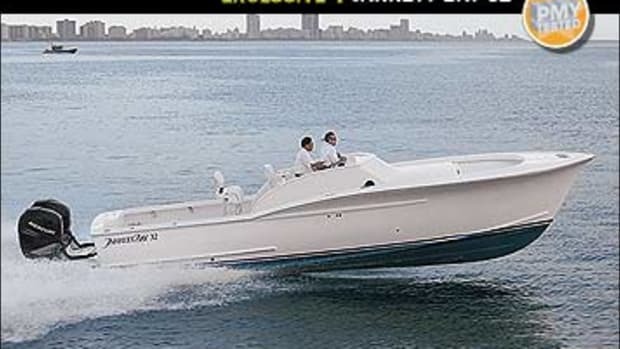 I did note that the lazarette, which houses the steering gear and Jarrett Bay-crafted trim-tab struts, can be accessed only via a 2&apos;8"H x 2&apos;2"W crawl space. Davis explained that this was done at the request of the owners who wanted the cockpit hatch sealed to ensure that any seawater would be kept out while aggressively backing down. If this were my boat I’d want a secondary means of access here so this space could be better utilized for stowage or perhaps a watertight door with a dead port in the crawl space, in case there were ever an issue with the through-hull fittings. But the real test of whether a boat like Waste Knot is a masterful traveler is not just about having the space to stow a lot of gear nor even about self-sufficiency; it’s the ability to take her owners where they want to go quickly, comfortably, and with minimal hassle. 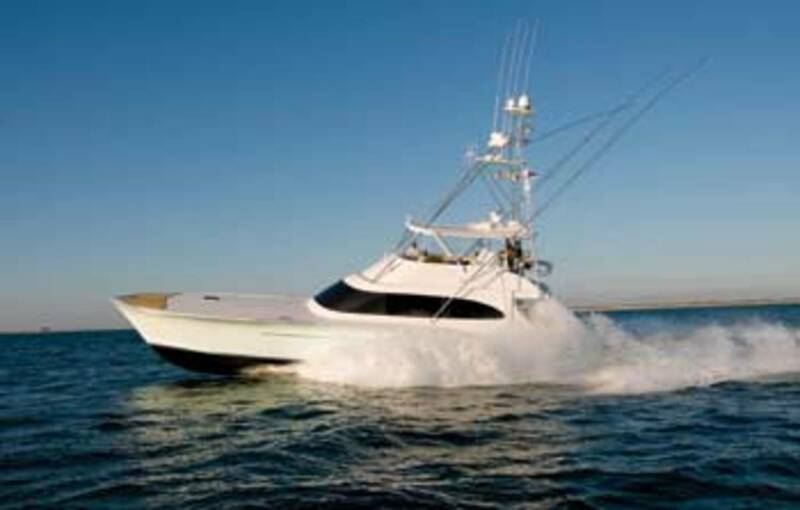 “The family wanted a boat that was bigger and faster [than their production 55-footer] with a dryer ride,” explained Davis. To achieve the “faster” part, the design team focused on two things: decreasing the bow wave and increasing water flow to the props. Thus the prop tunnels are conical, wider at the mouth and progressively narrowing as they go aft, which accelerates the water reaching the propeller blades, increasing their efficiency. 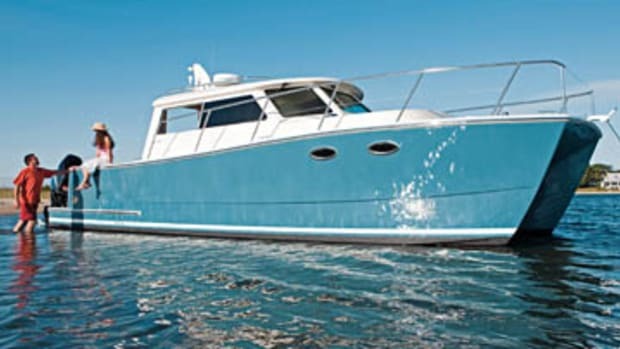 To reduce the bow wave, an indicator of hull resistance, the forward sections immediately abaft the entry are convex, which according to Davis, also sluices water into the tunnels and produces cleaner water both around and behind the boat. The concept, developed in tandem with MTU for an earlier project, seems to have worked; at WOT, my radar gun measured an exhilarating 46.1 mph. 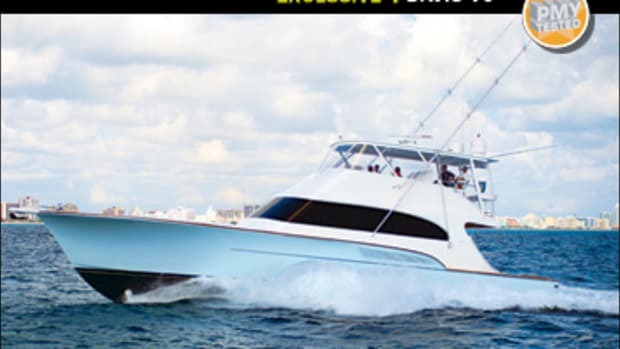 But more impressive, she reached this speed within 20 seconds of laying flat the Cat electronic controls, a gentle surge occurring when the turbos kicked in around 1800 rpm (see the acceleration curve at www.powerandmotoryacht.com). Slowing to 1770 rpm (28 mph), she tracked nicely as I put the wheel hard to starboard, creating four to five boat-length circles and wakes that slipped under our bow without so much as a bump. 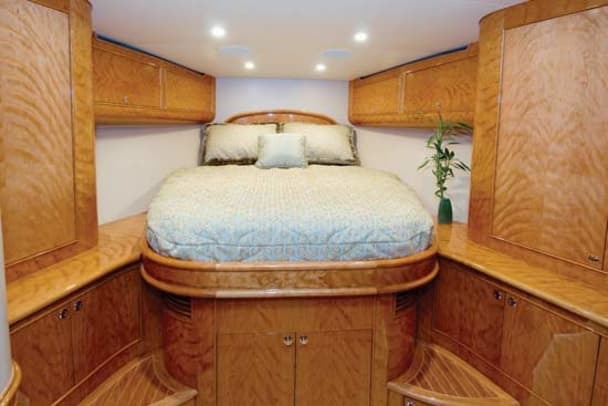 At the owners’ request, teak inlay graces the working area of the strongly cambered foredeck. 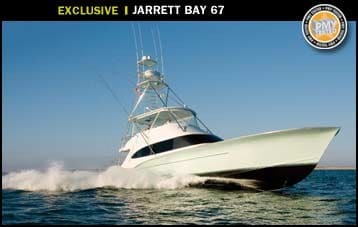 Providing better traction and a vintage look reminiscent of the 1960’s, it’s a first for Jarrett Bay. But below it is another impressive first. Since the owners rarely anchor out, they opted for a removable pulpit to preserve the vessel’s clean lines (and to keep the anchor out of the way). In-house metal workers devised a solution: The Fortress 55 Danforth anchor sits vertically in a cradle with a plastic bumper on its tip, which allows the closed hatch to keep the ground tackle secure while underway. When it’s time to set the hook, the entire cradle lifts and swivels into place, so all the crew needs to do is bolt down the pulpit. —G.R.